The first time I saw someone use a pendulum, I doubted what I was witnessing. I was certain that the person was playing a joke on me to see if I was gullible. Then she handed me the pendulum, and it spun under my fingers, even though I did nothing to make it swing. I was hooked from that moment on, and have been working with, and learning about, dowsing since 2004. While dowsing can be fun, it also has a serious side, and learning to use dowsing tools safely and accurately takes some time. Professional dowser, teacher, author, and past president of the Canadian Society of Dowsers, Susan Collins shared her knowledge of dowsing and dowsing tools with Val Tobin to help readers get an understanding of the practical applications of dowsing, the variety of tools available for dowsing, and how to get accurate information when dowsing. Collins used dowsing to locate earth lines in her home that were causing her ill-health and discomfort. Earth lines cover the earth in a grid formation and vary in intensity and impact on the body. If your bed is located on a noxious earth line, or at a point where lines intersect, it can cause toxic results in the body. Collins maintains that this was so in her case. She was diagnosed in 1982 with rheumatoid arthritis. With her hands curled into claws and barely able to walk, Collins was still searching for help after years of living with her condition. Then in 1999, she came across a book about dowsing called Dowsing and Your Health by Dr. Bailey, former president of the British Society of Dowsers. 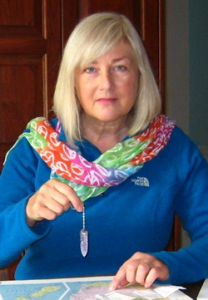 According to Collins, “I started to learn how to identify earth energies, environmental energies, eventually psychic energies, and brought myself to health.” After recovering her health, Collins decided to learn everything she could about dowsing, so that she could then help others who were also suffering and who did not have access to the information that she had found and which had changed her life. While many people are unaware of earth lines and the impact they may have on health, most have heard of using dowsing to find water. Dowsing for water with L-Rods or Y-Rods is a well-known practical use for dowsing. Some other uses for dowsing include dowsing food to verify that it is beneficial to eat, locating lost items, or inquiring about personal matters, such as on issues about career, relationships, or finances. While there is no arguing that the body is a convenient tool for dowsing, many prefer to use the pendulum. Pendulums are easy to use and convenient to carry, as they can fit into a pocket or purse. In a pinch, car keys or a necklace can substitute as a pendulum. Collins says that each finger of the hand carries an electrical charge, with the pinky being positive, the ring finger negative, the middle finger positive, the index finger negative and the thumb neutral. To hold the pendulum, hold the chain with the thumb, index, and middle finger. This way, you are holding the pendulum with a balance of charges: neutral, negative, and positive. You can verify the charge on the fingertips by using your pendulum. It will swing in one direction for positive and another for negative. Establish which direction is “yes” and which direction is “no” by asking the questions “show me yes” and then “show me no.” The pendulum will then swing in the directions associated with each. Collins says, “you want to have both feet on the ground, legs uncrossed, and make sure you’ve got water. Because the body is the primary instrument, it is important for the body to have water, food, be rested, and make sure you don’t have to go to the bathroom.” She also recommends putting up psychic protection. In her book Bridge Matter and Spirit with Dowsing, she outlines a protocol to follow for safe and accurate dowsing. This protocol includes balancing the body, connecting to the dowsing system by setting intent, working from a perspective of forgiveness of oneself and others, clearing away non-beneficial energies, maximizing your energy field, and getting permission to dowse (ask the pendulum if you are able to dowse for your question). This routine can be done quickly, once you are used to doing it and have it memorized. Following this protocol can boost your confidence in your session and therefore the trust that you have in the responses you get. Don’t make jokes. Don’t use slang. Be precise and take care with the language and tone you choose to use. Dowse in service for others. Practice on situations that are relevant to you, so rather than testing if a card in a deck is black, or if the card in a deck is red, dowse for finding a parking spot, or to see if you should select one food item over another, or to find out which elevator will arrive first. Have an attitude of detachment – the more emotionally invested you are in a question, the more challenging it can be to get accurate answers for it. If you are not willing to suffer the consequences of an inaccurate result from a question, then do not dowse on it. So, in other words, do not use your pendulum to determine whether to leave your spouse if acting on an incorrect response will cause problems in your life, which in this situation, it obviously can. Dowsing can be fun and enlightening and provides another avenue for improving your psychic abilities. The more you use energy and intuition, the better you get with it, and dowsing is just another tool that assists you in doing so. Since the time when I first picked up a pendulum as a non-believer, I have used it for anything from searching for my husband when I lost him in the supermarket, to connecting with spirits on a paranormal investigation. As long as you maintain a healthy respect for the energies you are accessing, and you always remember to put up your protections so that only beneficial energies interact with you, then dowsing can be a positive and rewarding experience. Collins, Susan. Bridge Matter and Spirit with Dowsing: A Practical Guide to Dowsing to Bring Balance to Your Life, third edition, King City: Puka Ha/Golden Crow, 2007. Dowser.ca (Accessed April 25, 2011). The Canadian Society of Dowsers Organization Website (Accessed April 25, 2011).